India’s opener Murali Vijay is set to make a comeback in the Test line-up. The century in the practice match against Cricket Australia XI has guaranteed a place for him at the top. Vijat looked at his fluent best with a knock of 129 from 132 balls in the 2nd innings. But originally, he wasn’t slated to open for India. He was dropped earlier midway through the England tour for his inconsistent form. Then, he was ignored for the Test series against Windies at home. 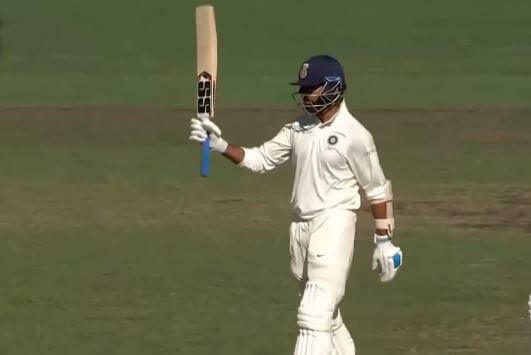 Prithvi Shaw made a sensational start to his Test career against Windies and became the first choice opener for the Tests in Australia. But the teenager suffered an ankle injury in the practice match that ruled him out of the first Test. Vijay, who had turned to County Cricket to play for Essex, had made a return to the Test squad on the back of good performances. In the 2nd innings of the practice match, he announced his comeback with a hundred. Now that Shaw is injured, India will go in with KL Rahul and Murali Vijay as the openers in Adelaide. Vijay reckons that he is ready and wants to contribute for the team. He has happy memories of Adelaide as he had scored a hundred on the last tour at the venue. “Basically, I am ready, I just want to go out there and contribute and give a good start for my team. I have always been aiming at that and nothing different this time. It’s an interesting series for us and hopefully, we can start it well,” cricket.com.au quoted Vijay as saying. “Always feels good to go to grounds where you have scored runs, it helps you a lot and I have good memories of it and looking forward to the Adelaide Test,” Vijay added.